The posts, which went up on Facebook and Twitter Tuesday morning, included pictures that the text described as "irrefutable evidence" of "direct cooperation and support provided by the US-led coalition to the ISIS terrorists." 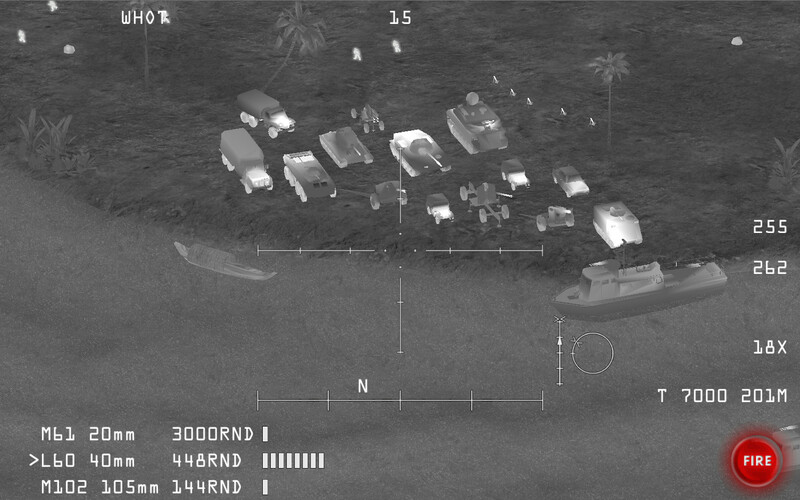 But as Kings College research associate Elliot Higgins noted on Twitter one of those pictures matches precisely with images found in an online trailer for AC-130 Gunship Simulator: Special Ops Squadron, a little-known mobile game from Byte Conveyor Studios. A warning from that trailer that the video was "Development footage / This is a work in progress / All content subject to change" was only partially cropped out of the Ministry of Defense posts, helping highlight the original source. The original tweet has since been deleted (archived here) and the Facebook post updated to remove the image from the game. Other images in the posts were seemingly taken from existingfootage that the Iraqi Air Force posted of attacks against ISIS and remain up on Facebook. "The Russian Ministry of Defense is investigating its civilian employee who mistakenly attached photos to a statement on the US-led coalition's interaction with the Islamic State militants in the area of Abu-Kamal," the military said in a statement given to Russia-affiliated outlet RT. AC-130 Gunship lets players provide air support to ground-based units in a Vietnam War setting, using the now-familiar black-and-white infrared targeting viewpoint popularized by footage from drones and other military aircraft (and used memorably in Call of Duty IV: Modern Warfare's "Death from Above" mission in 2007). The mobile game screenshots look passably realistic when shrunk down to thumbnails of nondescript trucks on dirt roads, but when blown up to full size, the angular polygons, sharp focus from afar, and lack of detail on the trucks make the image's true origins more apparent. Last year, a Russian UK embassy account used an obvious Command & Conquer screenshot to illustrate the supposed delivery of "chemical ammo" to extremists near Aleppo. There have also been plenty of instances of news outlets presenting game screenshots as real photographic evidence, including an Assassin's Creed backdrop standing in for war-torn Syria, a Fallout 4screenshot used to illustrate Russian hacking, an Arma II screenshot mistaken for an IRA attack on a British helicopter, a Halo UNSC logo mistaken for the real UN logo, and a Metal Gear Solid 5image used to illustrate child warriors in South Sudan. As games continue to become more realistic (especially at a cursory glance), it's going to become easier and easier to intentionally use their imagery as a stand-in for reality to less observant viewers. And as these kinds of game images increasingly clog up unrelated Google image searches, it's only going to become easier for sources to unintentionally present gaming screenshots as real-world scenes. Then again, once artificial intelligence figures out how to fully create convincing "news video" out of whole cloth, our ability to discern fantasy images from reality may be well and truly doomed.